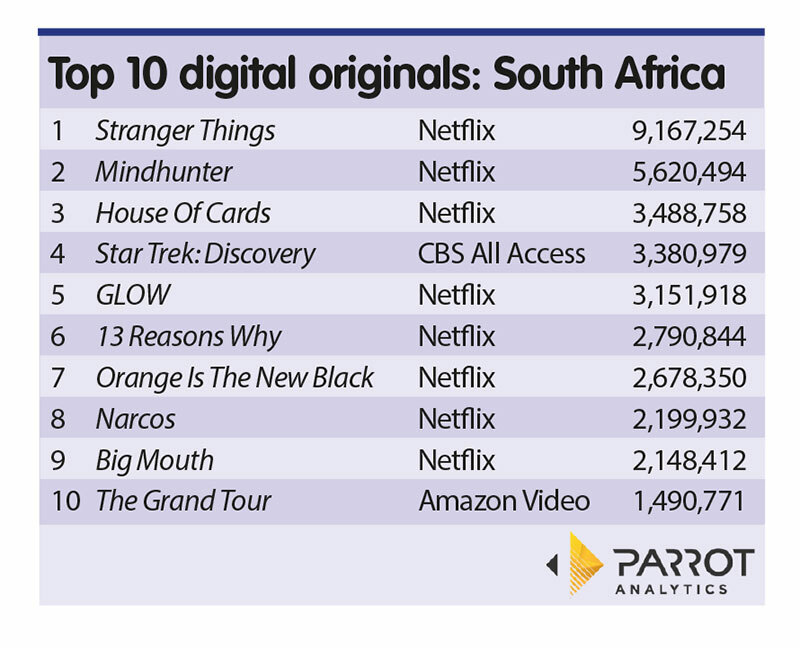 Netflix’s Stranger Things was far and away the most ‘in-demand’ digital original series in South Africa for the week ending November 5, according to the latest statistics from Parrot Analytics. Parrot Analytics analyses the demand for recent popular digital titles across international markets, based on the application of artificial intelligence to expressions of demand across social media, fan sites, peer-to-peer protocols and file-sharing platform. Stranger Things garnered 9.17 million in-demand expressions for the week from October 30-November 5, beating the number two original, Mindhunter by a large margin. Mindhunter garnered 5.62 million in-demand expressions, making the clear second-placed digital original ahead of number three House of Cards with 3.49 million. The list was dominated by Netflix. 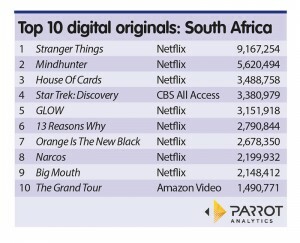 CBS All Access’s Star Trek: Discovery, the rights to which are held by Netflix internationally, took the number four slot, while Amazon’s The Grand Tour just made it onto the list in the number 10 position with 1.49 million in-demand expressions. All the other series on the list were Netflix originals. As part of a collaboration with Parrot Analytics, Digital TV Europe is providing regular updates on the most in-demand shows across key European markets in the coming months, based on Parrot’s unique datasets.